It's that time of year again, Starbucks has pulled out the red cups, stores are filled with holiday decorations, and the weather is changing...the holidays are here and it's time to figure out what to get everyone on your list. Don't forget all your friends on WGT, as you may spend more time with them than with your friends in the real world. Seriously, think about it. Gifting on WGT is easy. Just go the Pro Shop, find an item, click the big GIFT button and enter the WGT username. Note that you can only gift items to players if that item is unlocked based on their level or tier. You also can't gift the few items that unlock at tiers for Tour Pro thru Tour Legend players. Help out your friends who just can't seem to get their putting right. Putter Pal breaks down the swing meter into smaller increments making it easier to more accurately set the power of putts. Have a buddy who seems to slow down your multi-player rounds? Maybe one that likes to play in a hurry? Get them a Speed-Up Boost so they can play WGT games 2-4 times faster. Boosts don't affect your shots, distance or roll at all, just makes the display faster. Show off country pride with an avatar from any of our available country avatar collection, including USA, Canada, UK, England, Scotland, Ireland, Australia, Italy and more! Help your friends and family look stylish on the golf course by getting them a fancy new avatar! There's something for everyone so have some fun picking out the perfect look. Give the gift of a slow meter, in the form of these sleek new MAX Slow Meter golf balls. They offer good overall distance and spin, but the maximum amount of feel to ding more shots. And now with colored vapor trails! Thanks to the revolutionary RZN core, get the most distance with these Nike golf balls. You're friends will definitely thank you for these as they're crushing their drives! Get the best spin and back up your approach shots just like the pros with Cleveland Wedges. Add a top-performing Hybrid on WGT to complete any set. It's longer and more forgiving than the original R11, making it the perfect pairing for the R11S Driver and 3 Wood for top WGT players. Some bemoaned the fact that there was not a tighter finish to the Race to Dubai; rather more saw the week of the DP World Championship as a celebration of a thrilling young talent. 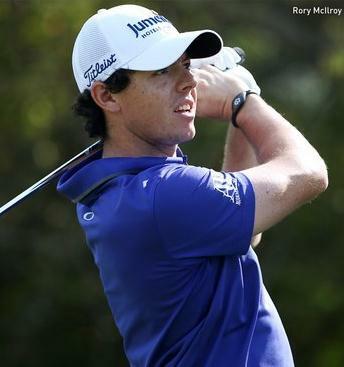 On or off the course, the 23-year-old Rory McIlroy is never dull. His every round is lit with a couple of believe-it-or-not recoveries while, when it comes to his press conferences, he always laces diplomacy with a delicious – if inadvertent – touch of the unexpected. In which connection, his proud father, Gerry, will tell you that not too much has changed. While watching his offspring last week, he recalled one of those precious Sundays of 15 or so years ago when he would take a rest from juggling the three jobs which helped him to fund Rory’s golfing sorties. On the Sabbath in question, he had played his usual nine holes with the child and accompanied him to the driving range before finally slumping in his chair. That was when Rory approached and insisted they return to the range – he had more work to do. Bannon, the Holywood professional for 15 years before moving on to Bangor GC, mentioned in passing that any jealousy towards McIlroy in those early days was short-lived; the culprits recognised almost at once that they were not in his league. “The jealousy would switch to awe,” he remembers. It has been much the same across McIlroy’s triumphant first five years on the European Tour. Listen to Anders Hansen on the subject: “If anyone feels anything in the way of resentment after what Rory’s done for the Tour, they would have to be mad,” suggested the Dane. Everything about McIlroy startled Hansen at the outset. “I first saw this curlyhaired kid on the putting green at a British Masters and didn’t have a clue whether it was a boy or a girl,” he began. “Long before I saw Rory hit a shot, I could see he was something special. Everything came so naturally to him. McIlroy interacts with spectators during his practice rounds – and always they return for the tournament days. Again, he is friendly with the photographers. They can snap him and he never snaps back. Dave Cannon, the supremo among cameramen, cites a day at the Open when his state-of-the-art-camera went off on its own on the 18th tee as McIlroy was about to hit. McIlroy pulled out of his drive and waited patiently for him to sort things out. “Are you ready now, Dave?” he asked. When, at the start of last week, George O’Grady awarded McIlroy – a five-times winner this season – his gold money-clip for 2013, no-one could have responded more graciously. “I’ll always be loyal to the European Tour,” he promised. He carried on saying all the right things and it was only when someone hit on the theme of how his wrapping up of The Race to Dubai had stripped the tail-end of the season of its excitement that he slipped up a tad. Asked if he would find it tough to get motivated for the week, he came up with an engagingly truthful, if rather too forthright, explanation as to why that would not apply. Another moment to savour came when he was asked about his switch – allegedly for $250 million over ten years – to Nike. Was he at all wary of changing clubs? The answer was in the negative. Warming to his theme, he added that he could probably get by with a hockey stick and an orange. You had to feel for those Nike club-makers who might even then have been working on the finishing touches to the world No. 1’s new set. Mind you, the chances are that they would have given a knowing nod to what the young man was saying. Round 2 of the Virtual U.S. Open Flashback tournament has started for all the players who posted a score in Round 1 that closed yesterday, 11/25. The current cut line is 154, requiring players to shoot an average of 77 in each of the first 2 unlimited-play rounds, in order to qualify for the final 2 single-play rounds. Remember, you need to post your Round 2 score by Sun, 12/2. Good luck! The overall leaderboard champion, plus one lucky sweepstakes player will each win a $500 USGA Shop gift card to use online for real golf equipment and USGA gear. See tournament rules for eligibility. Another big sale today for Cyber Monday... Get 3 free Nike 20XI-X virtual vapor balls when you buy $30 or more WGT Credits. These top-performing Nike virtual golf balls don't unlock until Level 75, but are yours free with today's offer. 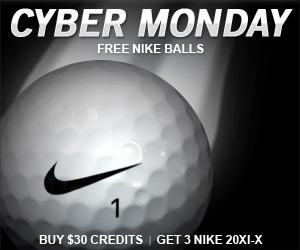 Just buy $30 or more WGT Credits as many times as you want on Cyber Monday, 11/26 to get more Nike balls. Stock up for the winter with these top-performing golf balls, yours free with today's offer! Use your WGT Credits to upgrade your WGT virtual equipment, enter online tournaments, or send gifts to your WGT friends for the holidays! *Unlimited offer available to WGT players who buy $30 or more WGT Credits on 11/26/12, get 3 free Nike 20XI-X virtual vapor golf balls (L75+) with each purchase. 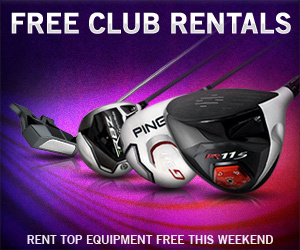 This weekend, rent any virtual club on World Golf Tour for FREE! We're thankful for you, our WGT players, so this Saturday thru Sunday you can rent virtual clubs for free in the Pro Shop. Rent any virtual club that you have unlocked for a 24-hour period free. 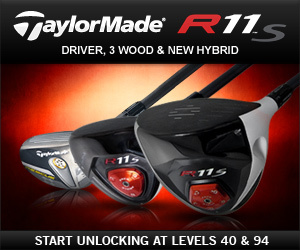 Try the latest TaylorMade R11S woods, the popular PING G20 clubs, the top Cleveland wedges, or the new MAX Control Putter. *Offer available to WGT players renting virtual clubs (not applicable to balls, avatars or boosts) 11/24/12-11/25/12, receive free virtual club rental for 24-hour period, and clubs can be re-rented during that time. Today only, get 1 free Nike 20XI-X virtual vapor ball (L75+) when you buy $10 or more WGT Credits. This top-performing Nike virtual ball doesn't usually unlock until Level 75, but is yours free with today's offer. Just buy $10 or more WGT Credits as many times as you want on Black Friday 11/23 to get more Nike balls. Use your WGT Credits to upgrade your WGT virtual equipment or enter online tournaments, like the Virtual U.S. Open Flashback – going on now! 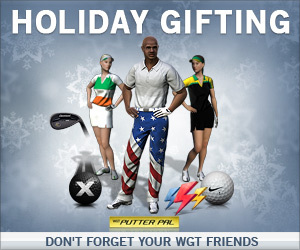 *Unlimited offer available to WGT players who buy $10 or more WGT Credits on 11/23/12, get 1 free Nike 20XI-X virtual vapor golf ball (L75+) with each purchase. Yani Tseng is still No.1 in the rankings. Stacy Lewis was clearly and fairly the LPGA’s 2012 Player of the Year. But the early-line favorite for 2013 No. 1 and POY might just be Korea’s willowy Na Yeon Choi. The LPGA concluded its official season with a stirring Florida duel Sunday between the most recent U.S. Women’s Open winners – Choi and So Yeon Ryu. Choi pulled away at the end and reminded us again how good she can be – like when she scorched Blackwolf Run at the Women’s Open in early July with a third-round 65 on a day when the field scoring average was closer to 77. 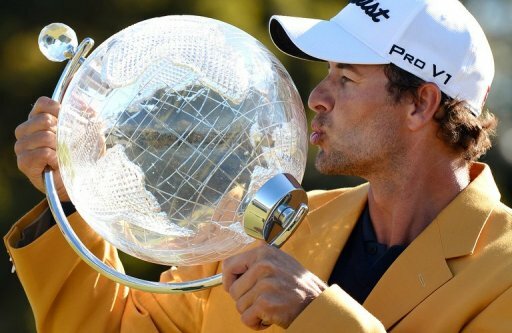 Meanwhile in Australia, Adam Scott won his country’s Masters while Brit Luke Donald triumphed in Japan and Henrik Stenson came up big in South Africa. Finally, it all went wrong in Hong Kong for Rory McIlroy in his last tune-up for this week’s Race to Dubai finale. McIlroy stumbled to eight bogeys and a four-putt double in 36 holes to miss the cut by three shots. Unfortunately for him, when you are world No. 1 and the presumptive Player of the Year on two major Tours, this is news. Clearly, global Rory is either a) Homesick, b) Lovesick, c) Human or d) All of the above and burned out, too. The vote here is d) All of the above and burned out, too. The winner in Hong Kong? That colorful Spanish bon vivant, Miguel Angel Jimenez. It’s great and everything that Stacy Lewis is the first American woman in 18 years to win the Rolex Player of the Year award on the LPGA Tour. But the most groundbreaking, wide-ranging, hand-clapping event to happen to the LPGA in years took place in a minute or less on Golf Channel during the telecast of the CME Group Titleholders last Thursday. In that segment, So Yeon Ryu and Sun Young Yoo (yes, as a matter of fact, I did have to go look up their names) talked – in remarkable English – about the differences in their names, their games and their personalities. I found out more about two prominent Korean players on the LPGA Tour in 30 seconds than I knew in the past five years. In case you were wondering, So Yeon Ryu is this year’s Rookie of the Year even though she won the U.S. Women’s Open last year. And Sun Young Yoo won the Kraft Nabisco, the first of the women’s major championships, earlier this year. Yeon and Young sound alike, while Yoo and Ryu are pronounced the same way. And on Golf Channel, the players had fun telling us about the differences and similarities. Whoever thought of this should get an expensive bottle of wine, a steak dinner and next weekend off. And they should be asked to do it again – and again. We’ve been waiting a long time for someone to tell us more about the young (or is it Yeon?) women on the LPGA Tour who come from Korea. Everyone knows about the language barrier. Until now, the Korean women have been reticent to learn English. Carolyn Bivens, the previous LPGA commissioner, was right even though her bedside manner was wrong when she said that the Koreans needed to make an effort to bridge the gap. Yani Tseng, the current No. 1 on the Rolex World Ranking, comes from Taiwan and knew little or no English when she first appeared on the LPGA Tour. But she has worked tirelessly on her second language and is wonderful in interviews both on television and in print. She proved it could be done. Now, if this Golf Channel segment is any indication, more progress is being made. The Koreans aren’t the only foreign-born players on the LPGA Tour. The continental Europeans – Suzann Pet-tersen, Sandra Gal and Azahara Muñoz, for instance, were taught English in school and their command of the language is practically flawless. But it’s apparently much more difficult for the Koreans because the languages are so different and they don’t get any training in school. Yet, that’s not an excuse. Like it or not, the LPGA Tour is based in the U.S. and most all the pro-am participants speak English, so the Koreans owe it to the Tour to at least make an effort to make a contribution off the course by learning the language. It’s no accident the LPGA uses its most prominent American players in its television advertising campaign. Like it or not, Paula Creamer, Natalie Gulbis, Morgan Pressel, Michelle Wie, and Brittany Lincicome, among others, are the faces of the Tour. And, along with Cristie Kerr and Lexi Thompson, the Tour needs marquee Americans to win more often to drum up more interest for women’s golf in this country. Which is why Lewis’ four victories and 16 top-10 finishes this year was such a boost to the game. Not since Beth Daniel in 1994 has an American been Player of the Year. Granted, in between we’ve had Annika Sorenstam, Lorena Ochoa and Tseng, with Laura Davies and Karrie Webb sprinkled in, who dominated the Tour during those years. This is not to imply that Lewis is the next dominant player. But she is wonderful for the women’s game. Her story is inspiring: She had scoliosis as a child and spent seven years, 18 hours a day in a body brace before she had spinal fusion surgery at age 18, with the possibility that she might never play golf again. Remarkably, she has five wins on Tour, including last year’s Kraft Nabisco. She is the top-ranked American player at No. 2. However, the LPGA Tour is full of talented players and the pool is deep with women from all over the world. Inbee Park leads the money list, Pettersen won in back-to-back weeks in Asia, Jiyai Shin is back to good form, Kerr got back into the winner’s circle and Tseng is working her way out of a slump. But that alone doesn’t solve the problems of the LPGA Tour. It still needs more events, particularly in the U.S., and in an uncertain economy, title sponsors in this country are harder and harder to come by. The product, however, is in its best shape in years, thanks to the quality of players on the course and off. If the players keep finding ways to be embraced by fans and sponsors alike, the women’s game can, in turn, find ways to grow. Success, which comes through winning by everyone involved, is easily translated into any language. Today only, save over 80% on a Cobra S3 Wedge Golf Club for only $24.99 (suggested retail $150). Visit WGT partner Divot.com for daily deals on golf equipment to help improve your game out on the golf course. There's a new deal every day, so be sure to check back for updates. *Offers subject to Divot.com terms and conditions. Shipping only within United States, US Territories, and Military APO addresses. Compete in the first ever Virtual U.S. Open Flashback tournament on World Golf Tour for your chance to win USGA Shop prizes. We're taking you back to recent U.S. Open championship courses in a special four-round stroke play tournament. It's free to enter, and you must play Round 1 by 11/25 in order to qualify for Round 2 and the prizes. The overall leaderboard champion, plus one lucky sweepstakes player will each win $500 USGA Shop gift cards to use online for real golf equipment and USGA gear. See tournament rules for eligibility.